First steps to a new socket: Making a cast, then building a test socket around it. Our constant focus on the latest prosthetic developments coupled with our aspirations to get the latest high-end products on the market lets us forget one important aspect: The prosthesis is only as good as the system by which it is connected to the human body. The last 20 or so years have seen some amazing developments in the prosthetic sector. Even if I just look at what happened for lower limb amputees, some of the developments have been life-changing for thousands of amputee and enabled many of us to live fulfilled and active lives. Ever since Otto Bock presented the first C-Leg in 1997, micro-processor controlled limbs are more and more the norm - at least in the many parts of the western world. I was a C-leg user between 2005 and 2012. And I loved it. I must admit that I was less keen on Otto Bock‘s 1C40 foot, as there were so many better products on the market. But then again that is wingeing on a high level. I was active. I was out and about and could do more or less what ever I wanted. I felt hardly limited by my amputation. That the C-Leg was not waterproof was an annoyance, nothing more. That it needed to be recharged every second night posed a bit of a challenge, but nothing that could not be dealt with. And many of these issues have been addressed since. Research and new developments in recent years have further improved many artificial limbs - and raised our expectations. For both - the development by the industry and our expectations - there seems to be no limit. And in many ways that is great. But the constant focus on the latest developments coupled with our aspirations to get the latest high-end products that are out there comes with a risk. The risk of losing sight of two key factors that are not to be under-estimated. Being an active amputee depends first and foremost on two main points: the right mind-set to be willing to put in the work to overcome obstacles on the one hand and a good socket that securely connects the artificial limb to your body on the other hand. These two are essential. All the rest is background music. The best, most expensive prosthesis cannot make up for the lack of either one of these issues. An amputee with the right mind-set and a first generation C-Leg attached to a worn out 1C40 foot but with a socket that fits well is very likely more active and able to live a life as he or she pleases than the very same amputee with a brand new, waterproof X3 with an amazing foot or a similar top-of-the-range combination of products from Össur or others but with a socket that does not fit well and as a consequence does not offer a reliable and secure connection between his/her body and the artificial limb. Even the best of orthopaedic technicians/prosthetists might have problems providing you with a socket that is up to the job. Not because they don‘t know their trade. Not at all. Many of them work wonders. But getting a socket that fits nicely is a very tricky process that needs time and patience. Even in the 21st century, building a good socket is often down to good old-fashioned craftsmanship and the experience of your prosthetist. Even in the best of circumstances. The challenges for the orthopaedic technician grow depending on your residual limb. For example, it's very hard to fit a socket to a stump, if the volume of your stump changes significantly over the course of a regular day. Vacuum/direct suction systems normally consist of an inner, softer container and an outer one most often made out of carbon fibre. As the name indicates, this system only works if there is complete contact between the residual limb and the socket. Once air enters the system, your leg slips off. While this system works well for many above-the-knee amputees, the process to get a well-fitting socket can be lengthy. Initially working from a test socket, step-by-step you and your technician find the perfect length for the container, develop the best contouring, see where you need the edges to be trimmed and cut-outs to be placed to allow your muscles to work within the socket while still providing you a snug fit and good support through an even distribution of your weight. A liner system is often used if - for one reason or another - the amputee cannot use a direct suction system. If, for example, a user has significant volume changes over the course of a day in his/her residual limb, then fitting a socket that maintains a good vacuum is close to impossible. A socket that fits nicely in the morning, may slip off later during the day. A socket that had a nice snug fit in the afternoon is impossible to get into just a few hours earlier. Here a liner system can be a good solution. A silicon liner is worn over the remaining thigh. The liner-covered leg is then inserted into a lubricated socket; similar to the one described for the vacuum/direct suction system. Small rubber lips running around the liner ensure the residual limb stays in position. If needs to, additional rubber rings can be added. The rather thick silicon lines adds additional padding, which many amputees find more comfortable than the vacuum system. An adjustable system is used, if neither one of the above-mentioned approaches work. Most outer containers used in for vacuum as well as in the liner systems are made from carbon fibre. This makes them light and pretty sturdy, which is great. And it makes them completely inflexible, which renders them useless for amputees who need to adjust the fit of their socket over the course of the day. This is were adjustable systems come into play. Most of them use a silicone liner - sometimes with a pin to lock it into the prosthesis - which rests in a semi-open container. There are different models on the market. Some work with flap-style cut-outs at the front and back of the socket, allowing for micro-compressions through pads, velcro-straps or a wire-system. Others have a more open design, working with a modular four-strut set-up in combination with a solid base plate and an adjustable brim to fine-tune compression according to the user‘s need. Osseointegration isn‘t really a socket. But it‘s a way of connecting an artificial limb with the human body. This approach is based on the fact that human bone cells have the ability to attach to metal surfaces. This offers amputees the possibility to have an anchor for an artificial limb permanently implanted into the human skeleton. 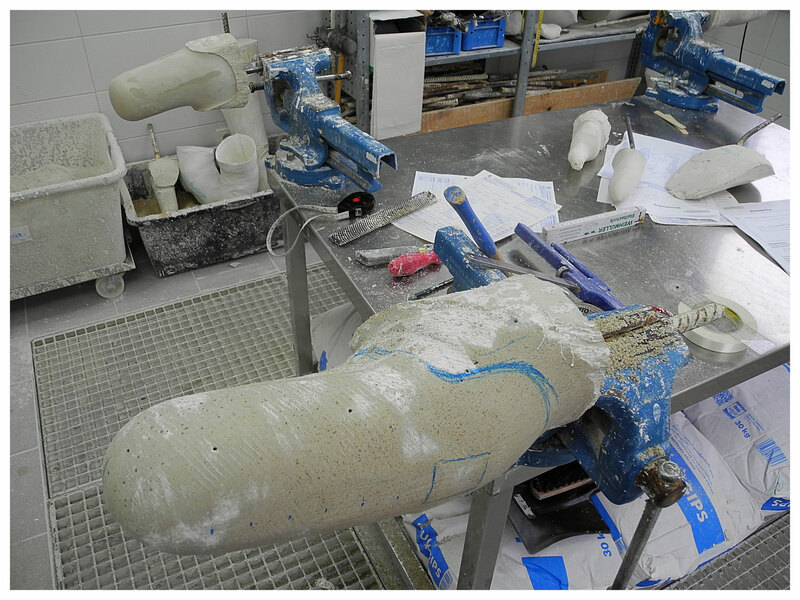 Once that is done, the prosthesis can easily be attached to the permanent anchor. The connection is a very secure and reliable one. But the Osseointegration method penetrates through the skin - something not all users are comfortable with. The first seven years as an amputee I have used the vacuum system. And it worked fine for me. No problems, even for long walks in the mountains or when living for years in tropical climates. But for the last four years I have been struggling with an increasingly bad fit of my socket. I experience changes in the volume of my residual limb through the course of the day. Things get worse when I am physically active. So after years of relying on a vacuum system I will soon try out a liner system, hoping it will finally allow me to get through the day without having to re-adjust the prosthesis 10 or more times though the course of a day. Hoping that it will finally allow me to be more active again.